This thesis examines processes of social inclusion in Australian community sport settings. In particular, it explores the social inclusion dimensions as related to one community group, Muslim women. The research considers how organisational policies, practices, programs and projects can facilitate or inhibit the social inclusion of Muslim women. Various elements of organisational inclusion were explored through a case study approach which involved three different community sport settings. The facilitation of social inclusion was examined through document analysis, individual and focus group interviews. There has been much written about social inclusion and social capital in sport. For the purposes of the thesis research a theoretical approach derived from Bailey’s (2008) social inclusion framework informed the methodology, including the data collection and data analysis. Four dimensions of social inclusion comprising ‘spatial’, ‘relational’, ‘functional’ and ‘power’, along with the associated two staged model, were used as a lens through which to view the case studies. Each case was individually constructed and analysed, within its organisational and community context, and the discussion section highlights the similarities and differences between the cases in relation to social inclusion facilitation. The research findings indicate that organisational practices and policies can both facilitate and inhibit social inclusion, and that there are associated complex, multifaceted interactions which produce individually constructed participation and inclusion outcomes. Successful practices identified in the case studies were those that engaged Islamic families through cultural intermediaries and supported Islamic practices. The way in which the dimensions of social inclusion interact is elaborated on in the discussion section of the thesis. The thesis empirically assessed the theoretical model and comments on its strengths and shortcomings in relation to this particular context. The case studies provide an insight into the interconnected nature of the social inclusion dimensions and formed the basis for the development of a modified social inclusion framework. This reworked framework provides a conceptual basis from which to analyse processes involved in the social inclusion of specifically identified groups in community sport settings. Furthermore, the research highlights the complexities associated with social inclusion and its close nexus with social exclusion. The latter can marginalise individuals that have different cultural or other practices, expectations or requirements from those of individuals from mainstream communities. 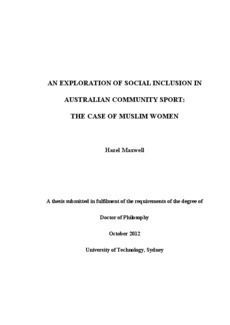 Nevertheless, the research provides evidence of the effectiveness of social inclusion initiatives in community sport, and demonstrates that proactive policies, culturally appropriate practices and well-designed programs can lead to the increased participation of Muslim women. The thesis findings contribute to the body of knowledge around social inclusion by providing a unique insight into the dynamics of social inclusion/exclusion.